Americans are fond of claiming that ours is the greatest country on earth. Yet when measuring quality-of-life, education, healthcare, voting rights, equality, and so much more, we aren’t even in the top ten nations. So what needs to be done? Plenty. Serious problems haunt America. While clamoring about our national greatness we have fallen behind more enlightened nations in education, healthcare, life expectancy, economic fairness, equality, and overall quality of living. A big part of the problem is that, collectively, we suffer from an obsession with money. We constantly confuse cost with value. We put profits over people and warfare over welfare. We choose consumerism over compassion and principal over principle. We value specie over species and wealth over health. There is a litany of horror currently under way in America. Don’t believe me? Watch as our land is fracked, our air is contaminated, our aging bridges collapse, our oil trains explode, our food is overly processed — and everywhere, the moneyed interests succeed while the rest of America fails. Too many people live amidst a plethora of pain and suffering brought on by a glut of greed. For a large number of people in our nation, the rules for behavior are as follows: fortune above friendship, property above propriety, venality above virtue, dough above decency, funds above friends, gold above goodness, and riches above righteousness. What is so incredibly frustrating is that WE KNOW ALL THIS. Further, we actually know what needs to be done to correct the problems, or at least get on the right path to making things better. Let’s take a quick peek at the policies that would help America realize its place as the self-imposed greatest country in the world. The problem isn’t bad politics — the problem is bad people in politics. Candidates in the moron party are against all of the USA To-Do List, which means any Democratic or Independent candidate would be better than any member of the American Taliban. You can help America while helping humanity. 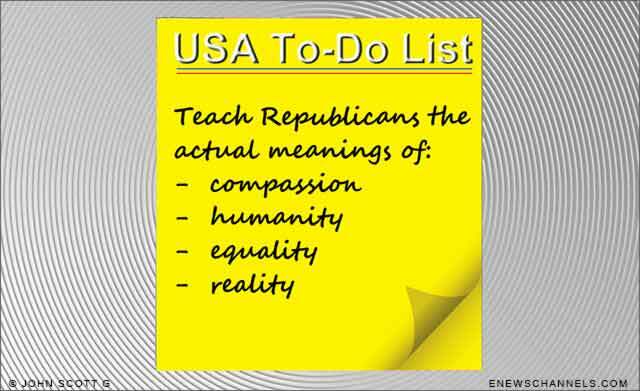 You can help us check off the items on the USA To-Do List. It all begins with you at the ballot box. Stop voting for morons. Stop voting for troglodytes. Stop voting for corporate lackeys. Stop voting for greedwhores. Stop voting for racists. Stop voting for people whose party wants to stop people from voting. When in doubt, just remember this simple acronym: STOP GOP. For those of you who prefer a bit more nuance, let me express it this way: Do not vote for any RWNJD (that would be, of course, right-wing nut-job douchebag). Finally, let me answer those simpleminded folks who send me the misspelled email messages. No, I am not a member of the Democratic Party. (I am not a member of any political party.) No, I am not a liberal — I am way beyond merely liberal. I am a progressive. And I would like to see some progress in this country. Checking off the items on that list represents progress. And it’s the only way we will ever deserve to call ourselves great.